Note: This was written primarily as an educational piece for retail staff. Read it in that light. A good home theatre system can make a DVD look just about as good as the picture seen in a quality cinema. But this costs big dollars: think $17,000 or more for the projector, a couple of thousand more for a screen … you get the idea. A good home theatre system can deliver the perceived sound quality of a cinema for a great deal less. Think under $5,000. Even $2,000 worth of surround sound system can deliver decent results in a modest room. Unfortunately, far too many systems don't sound anywhere near as good as they should, just for the lack of a little setting up. You ought to know about this for two reasons: so that the customers hear the best your surround sound systems have to offer, and so you can advise the purchasers on how to achieve the same quality at home. Surround sound is a lot more complicated than the days of stereo. Back then, it was easy. Two speakers on two corners of a triangle, the listener on the third. Adjust the volume control, press play and you were in business. But these days the idea is to make the lounge room sound like a cinema. That means the five speaker channels have to be balanced and time-aligned. Sounds complicated, and it is. But it's so important that just about every home theatre sound system provides the necessary settings to make things sound just right. A full home theatre speaker system have five main speakers and a subwoofer. If the subwoofer is too loud, the system will sound boomy. It might make for impressive bombs during movies, but male voices will sound King Kong-ish, the bass in much music will be overpowering and, in many cases, the subwoofer will run out of oomph. If it's too quiet, the system will sound like a wimp and the customers won't be able to impress their neighbours. The other five speakers ought to deliver sound at the same levels relative to each other as the movie makers intended. Most voices, for example, come out of the centre channel. If this isn't the right level, the dialogue might pound the watchers and be very tiring, or it might be too quiet. If the surround (or rear) speakers (the two that should be slightly behind the couch) are too loud, sounds that are supposed to be near the screen will sound like they are right in front of the viewers. Not good. All the good books on home theatre will tell you that each of the five main speakers are supposed to be the same distance from the listener. But let's face it, they aren't. The rear speakers are normally a lot closer. Now there is this weird acoustic phenomenon called the Haas Effect. This says that if the same sound comes from two directions, and one of them gets to your ears just a little bit before the other, both sounds seem like they are coming from that direction. That applies even if the second sound is quite a bit louder. If a movie has a car door slamming on the front left speaker, with a little of the sound fed into the rear left speaker, and that rear speaker is a lot closer to you, guess where the sound will seem to be coming from? Time-alignment is a feature of home theatre systems that delays the sounds coming out of some of the speakers so that they all seem to be the same distance from you. It is the home theatre receiver upon which all the adjustments are made. Of course, there are a number of systems which don't have a receiver as such. No worries, the combination DVD player/receiver ought to be able to do the same thing. If it can't, then it isn't really the type of product to recommend to the customers. To start the process, look for a key on the remote control called 'setup'. Very rarely it's called something else. You may (horror!) have to consult the unit's manual in this case. Now, how you use the setup functions varies according to whether the receiver (or box of electronics) has an on-screen display. If it does, then plugging the receiver into a TV (using either the composite video or S-Video monitor output on the back) makes things easier. If it doesn't, you'll have to make do with the display on the front of the receiver. Either way, the setup key brings up a menu, from which you can select the necessary options. The one we're interested in will be called something like 'Speaker Setup'. Here you will set the speaker size. 'Large' speakers get the unadulterated sound from the movie. 'Small' ones have the bass yanked out (don't worry, it's redirected to the subwoofer). And here you will also set the channel balance. Most systems have a test tone, which pumps some noise out of each of the channels in turn. This should sound at the same volume for each channel. If not, as it cycles through you can adjust the level of a particular channel up or down to make it match the others. Doing this with just your ears is hard. 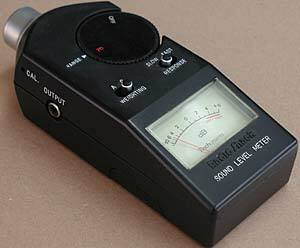 See the store manager and ask if petty cash can spring for $49.94 for a Sound Level Meter from Tandy Electronics. You want the one with the swinging-needle meter, not the digital display: catalogue number formerly 33-2050, now Q1461. This makes things a lot easier, especially balancing the subwoofer. On the meter set the 'Weighting' switch to 'C' and the 'Response' switch to 'Slow'. Strangely, this step is easier. In the same area of the setup menu you'll find an entry talking about speaker distances or delay times. Most systems these days use distances. Just measure the distance between the usual customer area and each speaker in turn, then enter those measurements into the menu for the relevant speakers. Most provide 300mm increments, so just pick the closest one. If the system requires you to enter delay times instead, don't worry. You measure the distance to the front speakers. Then measure the distance to the rear speakers. Subtract this measure from the first one. Let's say this comes to one metre (that is, the rear speakers are a metre closer than the front speakers). Multiply by three and this is the number you enter in the menu for the rear speaker: 3 milliseconds (sound travels around 330 metres per second). Pick a really impressive sound track, say the gun battle in the movie Heat. This has plenty of exciting sounds from all directions. Then let the system speak for itself!